Accepting an intermediate frequency (IF) input signal in the range of 2 MHz to 70 MHz, MORF provides an RF output signal between 2 MHz and 3000 MHz with 5 kHz tuning resolution. Additional features include 50 dB of attenuation control over the RF amplitude and two IF bandwidth options of 4 MHz and 35 MHz. The MORF is configurable via any serial terminal program or an optional graphical user interface (GUI). NuWaves’ Multi-Octave RF Upconverter, or MORF™, is a small and versatile RF upconverter module featuring programmable IF and RF frequencies, variable attenuation control, and user-selectable IF bandwidth filtering. 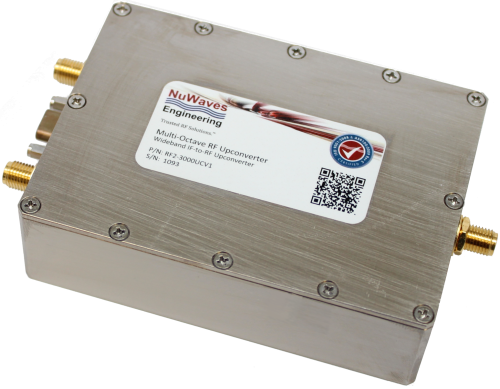 MORF applications include RF communications systems including software defined radios (SDR), telemetry, electronic warfare systems including SIGINT, ELINT, COMINT, etc. A development kit that includes the GUI software for the PC Control Panel and an interface cable assembly is available as an ordering option. Demo Units are available to qualified customers.